Today I'm talking with Erin of the blog, Reading My Tea Leaves. I've been following Erin before she moved to NYC and was living in Wilmington, NC. Her blog gives a glimpse into her everyday life and boy, is it pretty. She lives in a teeny apartment and shares tips for surviving in a small space. I love her week in object series, and her way of making the everyday mundane things so beautiful. She's the type of person I'd love to meet for an early morning cup of coffee and a cheese & chive biscuit (or maybe a slice of this) and discuss making the world a better place. Erin, what's your favorite food? Erin: When I first thought about my favorite foods, my thoughts turned to favorite dishes. I started dreaming about the buttery, flaky crusts that encase savory tarts filled with sweet leeks and fresh eggs and cream. Then I dreamed up a lasagne oozing with ricotta and winter spinach and drenched in a rich red tomato sauce. Next, a kale salad tossed with lemon and parmesan and sprinkled with hazelnuts. And finally, dessert and rich chocolate cake topped with barely sweet cream. 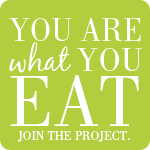 But for Adrienne's question, I decided I wanted to think about individual foods: those things that we eat that are so interesting and inspiring that they stand up all on their own. With spring arriving to the New York City Greenmarket, I couldn't help but turn my attention to the red-veined sorrel popping up on farmer's stands. 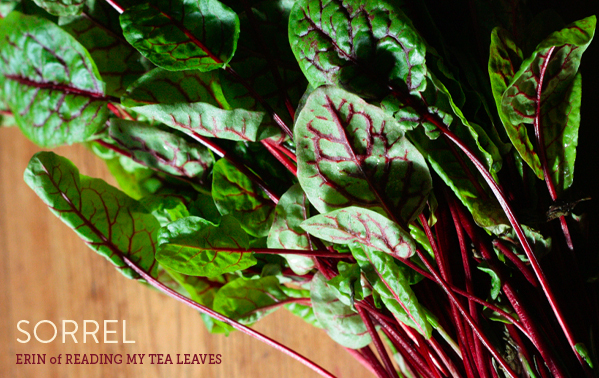 Sorrel isn't a longtime favorite of mine, but it stole my heart last year at this time and I haven't turned back since. The taste is sharp and lemony and yes, something about it evokes the sweet and the sour of an early spring strawberry. If it's tossed into a salad, I promise, you hardly need a dressing at all. We're on a plane to Seattle right now! We'll be there for a couple of days before heading north to Vancouver, BC. I'm so excited to get away, for cooler temperatures, awesome coffee, delicious food, and to explore new places. I have a few posts scheduled for next week, so be sure to check them out. Until then, see you in a week! That's it. I've decided. I need more sorrel in my life. A kale salad with lemon sounds pretty good.